Ford Motor Co.'s gamble that consumers would embrace a fuel-efficient V-6 in their F-150 full-size pickup hit a milestone Wednesday with confirmation that 100,000 trucks with the smaller EcoBoost engine have been sold this year. The last time Ford sold that many pickups with a V-6 was in 1985, according to Doug Scott, group marketing manager for F-Series trucks. In recent months, about 40 percent of F-150 buyers have been paying an $895 premium for a turbocharged, direct-injection 3.5-liter V-6 that was designed to deliver the power of a V-8 but fuel efficiency of a V-6. Ford also offers the truck with a conventional 3.7-liter V-6. The first pickups with the EcoBoost V-6 were sold in late February. The take-rate hit 40 percent by May and has remained that high ever since. 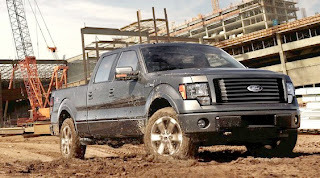 Demand prompted Ford to increase production a couple months ago of the truck with the EcoBoost engine. Total sales of the pickup with one of the two V-6s offered are more than half of all the trucks sold. Ford makes the F-150 at the Dearborn Truck and Kansas City assembly plants. The Biggest and The Baddest! The Rose Bowl – The Grandaddy Of Them All, as they say – is one of the most storied bowl games in college football, and the pre-game parade is a big part of the pageantry of the event. Last year, Natural Balance broke the record for the world's largest float with an 84,300-pound rolling display, but the pet food company seems thirsty for more world-record glory. For 2012, Natural Balance is building a 100,000-pound monstrosity that is 116 feet long and contains a 65-foot wave pool built specifically for one Tillman the Dog. Tillman will be surfing the waves on the float, which sounds impressive if you didn't already know that this super dog is also an avid skateboarder. To tow this massive float, the folks at Natural Balance are counting on power from the tried-and-true Ford 6.8-liter V10. The 362 horsepower mill, which boasts 457 pound-feet of torque, is completely stock. The same can be said for the six-speed automatic transmission, save for a custom gear reduction setup behind the output shaft to get the float moving. The beefy 10-pot was pulled directly from an F-650, but we're guessing the 28-foot long truck won't be getting a 100,000-pound tow rating anytime soon. Four-Time Winner-Motor Trend 2012 Truck Of The Year!! If you own a Ford F-150, it won’t surprise you that it was just awarded the Motor Trend 2012 Truck of the Year®. In fact, the F-150 has won that honor four times – the most awards for any truck since Motor Trend began presenting the Truck of the Year award in 1989! And, with more than a half-million sales through November and a lead of almost 150,000 sales versus the nearest competitor this year, the Ford F-Series is on track to extend its streak of truck leadership to 35 straight years. Do you have your own reasons why you think the Ford F-150 should be your personal truck of the year? Helping spark the truck’s continued success is the powerful and fuel-efficient 3.5-liter EcoBoost™ engine, which now accounts for more than 40 percent of F-150 retail sales and is on pace to exceed 100,000 sales in less than a full year on the market.